You can do that and much more with the freeware program Voice Flux Pro. (Note that you may need to install Microsoft Speech API). I'm using an el-cheapo $10 computer mic, and it works fine. Surprisingly no voice training was required. 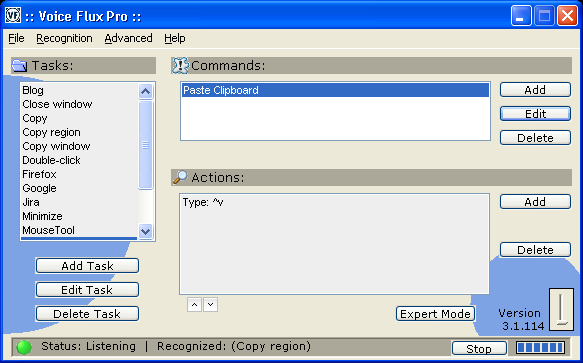 Note that this program isn't for dictating text but for running commands and programs. posted by Jonathan at 5/17/2006 12:17:00 a.m.
By Phil, at 5/17/2006 2:07 a.m.
By Yoz, at 5/17/2006 3:55 a.m.
By Jonathan, at 5/17/2006 10:48 a.m.
Another tip - if you find that it is picking up keyboard presses, mouse clicks, and background noise as commands, put "please" at the end of your commands. By Jonathan, at 5/17/2006 12:49 p.m.
By Anonymous, at 6/12/2007 12:16 a.m.
Oof - Not sure why they've shut down. You might be able to find a copy floating around the net. I've since uninstalled Voice Flux. Just got kind of annoying for stray sounds to be picked up. Also good ol' reliable typing seems best, for me anyway. By Jonathan, at 6/12/2007 6:09 p.m.
hi, i'm trying to find that file too. but basically all the links are broken, i'm wondering if anyone has the set-up file?? please if you do, let me know. i really wanna work with the program thanks. By 'shishkabob, at 6/08/2008 6:08 a.m.
By Jonathan, at 6/08/2008 7:33 p.m.
By BananaAcid, at 8/30/2008 6:03 p.m. I am having all sorts of trouble finding it. I have scoured the internet but cant find a version. By Nigel, at 9/26/2009 1:36 a.m.